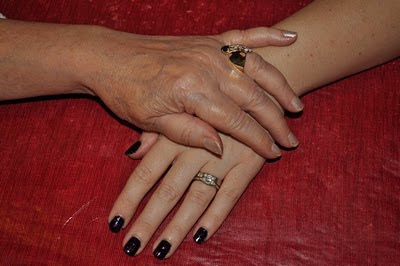 Once a week I give Mom a manicure. I like this time with Mom because it gives us a regular routine of spending quality time together. Sometimes we have to build these moments into our life, moments when we are just present with another person without the distraction of people or television. When we do not consciously make the time, we often lose the opportunity to really connect with others. I learn the most about how Mom is feeling when we have this one-on-one time. I am glad this small ritual gives us these moments of greater knowing and understanding of one another. Painting Mom’s nails also provides me with a lesson in life. When I hold her hands, with the absolutely perfectly smooth and soft skin I have always wished I had, I try to steady her tremors. What I noticed though is if I attempt to hold her hand steady, I actually make the tremors worse. It is as if her hands are trying to push back at my attempt to hold them still. This has been a good learning experience for me to stop trying to control life and live in the moment, accepting things as they are. Sometimes Mom gets annoyed with the tremors and apologizes for them. I keep telling her it does not matter if her hands shake, it is not a problem. I want Mom to know that I and other people will love her and care for her no matter what happens. There is no need to apologize for who you are or what is happening to you. We will be there to paint your nails, help you get dressed, or do whatever else you need. And there is just something about human touch that is healing and important. When my husband was taking pictures for this blog post, we did many different poses. Most of them were with my hand over Mom’s and for some reason, none of the photos really looked right. Then this photo pictured here jumped out at me as the correct one. My hand over Mom’s did not look right, but this one, with her hand over mine does. It reminds me off all the times Mom has reached out her hand to take care of me. To hold my hand when I was scared or pat my hand to remind me she is right next to me. This was the right photo which showed our relationship and our personalities. Mom is the one with the beautiful understated yet elegant fashion with the subtle nail color, and I am the one with the love of bold colors such as black with purple sparkles. It is amazing to me how one small act in life, which probably takes a half hour a week, can teach me so many lessons and reflects so much about who Mom and I are. I am so glad you all are back home! I know home care is hard but I know you were both so tired of the hospital setting. Roles in our relationships do change as we care for our loved ones. You both have been in my thoughts and prayers and I still think of the day we met as a blessing. Thank you for reading my blog. It has been important for me to see that so many of us, patients and caregivers, have similar joys and difficulties in our lives, no matter what the illness is. Hopefully we can all help each other. To Nag or Not to Nag? When Are You Moving Out?